The International Olympic Committee has announced a £1.3m emergency fund will be made available to national Olympic committees in order to help refugees. 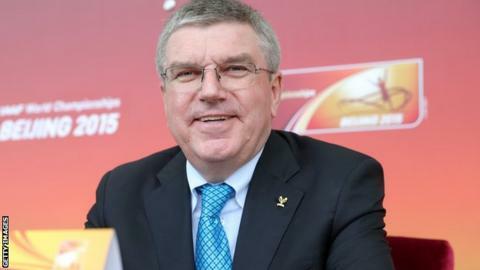 "We have all been touched by the terrible news and the heartbreaking stories in the past few days," said IOC president Thomas Bach. "We made a decision that we needed to make this fund available immediately." On Thursday, German football club Bayern Munich announced they would set up a 'training camp' to help refugees. National Olympic committees will be asked to submit programmes to benefit from the fund, which is made up of £650,000 from the IOC and £650,000 from the Olympic Solidarity Commission. British sport has also reacted to the crisis, with supporters' groups for Aston Villa and Swindon Town among those who have said they will hold up 'Refugees Welcome' banners at their next home matches. Scottish champions Celtic have also offered their support. A share of proceeds from events surrounding the upcoming 30th anniversary of former manager Jock Stein's death will be donated to the refugees' cause. Great Britain 400m runner Martyn Rooney: "The Premier League clubs should definitely help. If they can spend so much money on transfers then they should be able to give money to this cause. "[Great Britain team-mate] Rabah Yousif is from the Sudan. He fled and came to the UK. He said the UK saved his life. So we all have a duty to help our fellow man". England cricketer Anya Shrubsole: "Sport has a responsibility to lead the way and take responsibility for encouraging people to help." England hockey player Kate Richardson-Walsh: "Large corporations and organisations should help if they have the resources. Sport should do what it can. It's the responsibility of everyone to help if they can." All three were speaking on BBC Radio 5 live's Sports Panel.